My friend asked me whether it is possible to have a delicious and liked a wholesome home cooked meal in Johor Bahru. I told him that there are plenty of coffee shops and food courts in Johor Bahru that served delicious food. He told me that he prefer to have this wholesome delicious meal in a small restaurant; and his budget for 2 persons should not cost more than RM50 ( US$16 or S$20). Well this was quite a challenge as his budget was rather low for a lunch meal for 2 persons at a restaurant. He said that he understand that for this budget he was not expecting to have steam fish, crabs or large prawns; just a normal simple meal. As we were in Johor Bahru, I took him to a small Chinese restaurant. I wasn’t sure at that time whether I could ordered some food from the menu to suit his budget; but I took up his challenge – as I had been to this restaurant very often. Below are the photos of the food that we ate for RM49.20 – which is inclusive of service charge and towels ( those paper towels). 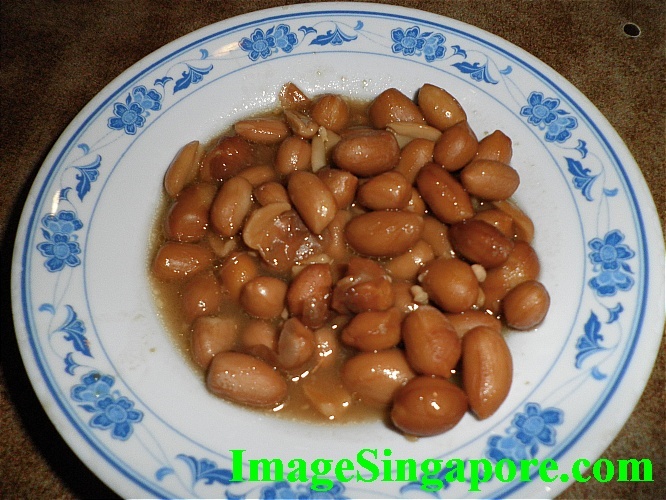 1) Braised Sweet peanuts. This so called homemade by the restaurant. Not too sweet and salty and it compliment very well with porridge. This is a food that I enjoy eating and it is nutritious too. 2. Sweet Potatoes Porridge – Instead of eating rice, I had decided to order sweet potatoes porridge. 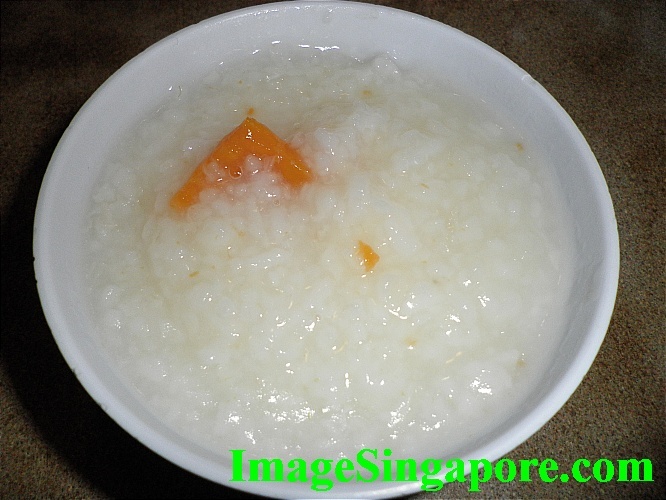 Porridge is easier to digest and the added sweet potatoes in the porridge gives it a sweet and delicious taste. In total both of us consume 4 bowls of porridge. My mum cooked this porridge quite frequently when I was young. 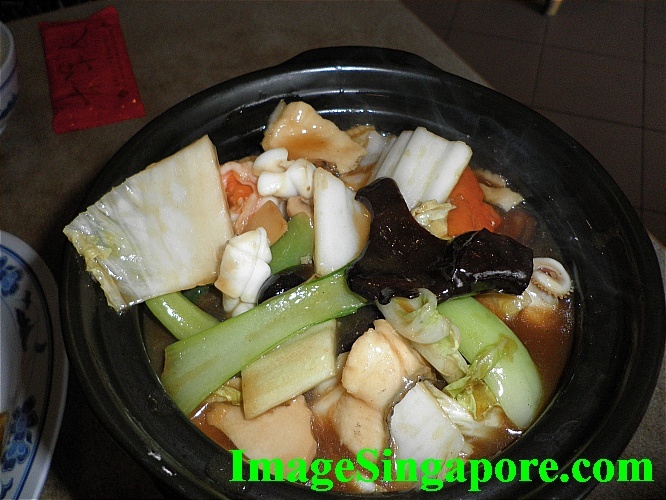 3) Mixed Seafood in Claypot – There were a few prawns, slices of fish, squid, mushroom, toufu, black fungus, and vegetables in this claypot. The size is small but was sufficient for 2 persons. I enjoyed eating from claypot because the food is boiling hot and it taste better. 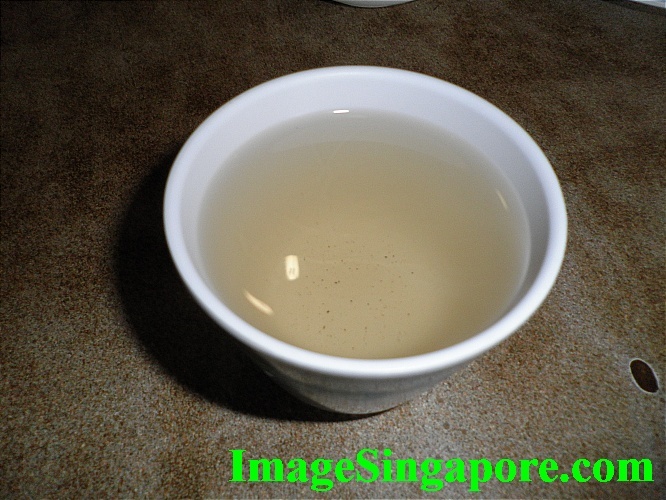 I normally take the gravy from the claypot and pour it into the rice or porridge. 4. 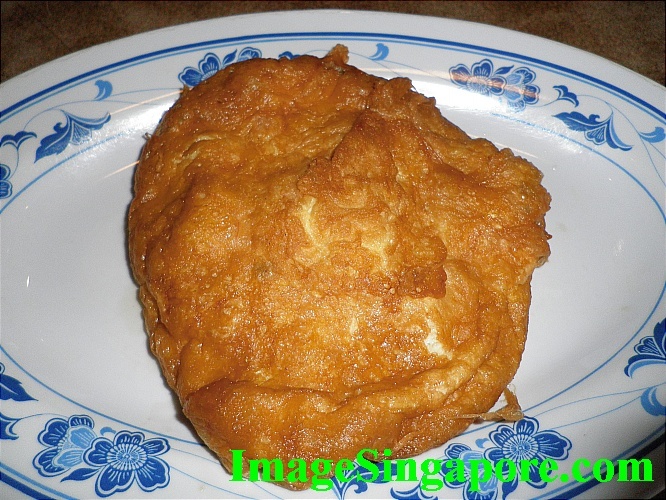 Prawn Omelette – The prawn omelette was slightly overdone. Perhaps it is due to ensure that the small prawns inside the omelette was well done. My next meal I would try the bitter gourd or onions omelette. Anyway for the portion that we were having, this food was definitely sufficient for 2 persons. 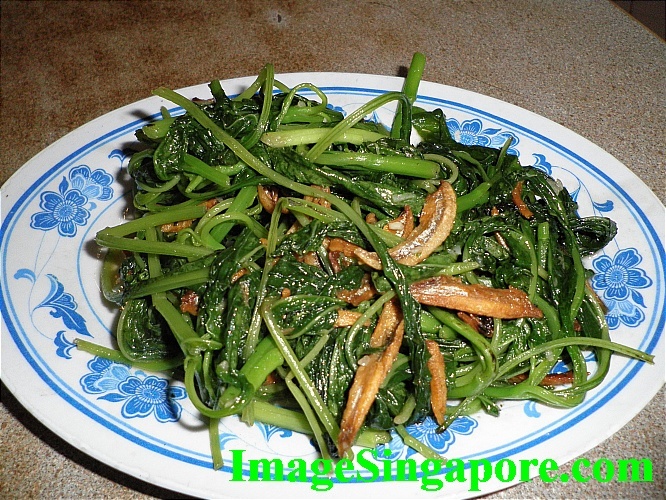 5) Fried Spinach with Anchovy – This is a popular dish that you can commonly find in a Chinese restaurant. Spinach is good for health and it contains lots of fiber as well. There was a generous amount of anchovy given in this dish. Spinach can also be cooked in a wet style with eggs added into it to form a rich gravy. 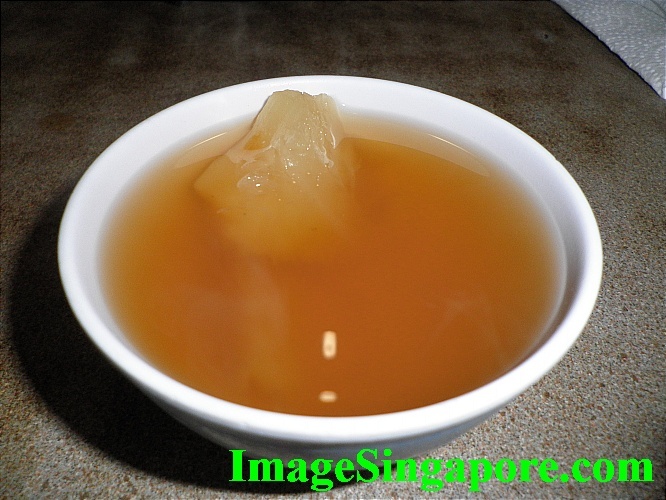 6) Taiwan Sour Bean Curd Soup with added Vinegar – Unless you are fond of vinegar, you would not liked this soup because there is a strong taste of vinegar in this soup. This is a totally vegetarian soup that resembles the shark fin soup that you find in a Chinese restaurant. 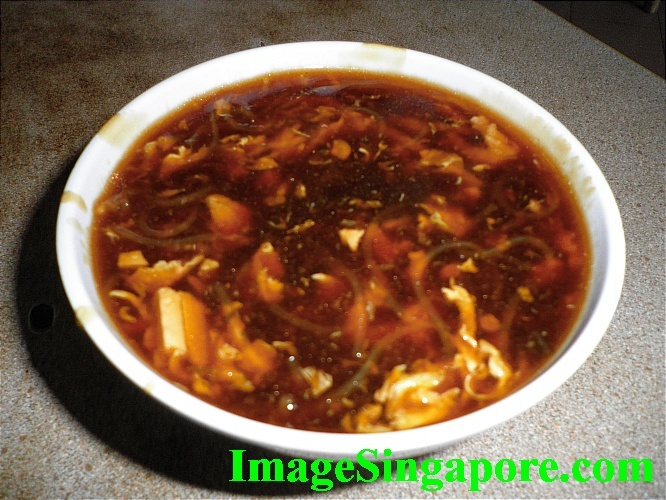 It is thick but easy to swallow – soft bean curd, vermicilli and vegetables are added. 7) Desert – Tapioca with Ginger and Longan. This is a desert that I enjoyed very much. I understand this desert is good for health especially your stomach. This desert was given complimentary when we ordered our food. 8) A pot of Chinese Tea. You can asked for free refilled of hot water into the pot. The photo of the tea cup show a very diluted tea – that was because I was too eager to pour it into the cup before the tea was properly brewed in the pot. I prefer to drink Chinese tea when I am eating Chinese food. So there you have it – all the above food for just RM50 ( US$16 or S$20 ) inclusive of service charges and towels. My friend was impressed with the good value of this meal at such a reasonable price. There are many food outlets in Johor Bahru that offer good food at cheap prices. My advice is don’t go to the shopping mall; as food ordered in a restaurant located in the mall is normally more expensive.